Despite reductions in clarity, Lake Tahoe's water is exceptionally pure at 99.994% pure. At a surface elevation of 1,897 meters (6,225 feet), it straddles the border between California and Nevada, west of Carson City. It is the largest alpine lake in North America. Lake Tahoe is believed to be one of the 20 oldest lakes on earth. Lake Tahoe's water is not as clear as it once was. Readings of the water's clarity began in the 1960s and since then it decreased from 100 feet to 64.1 feet in 1997. However efforts to improve the environment have led to improved clarity, by 20% between 2011 and 2014. 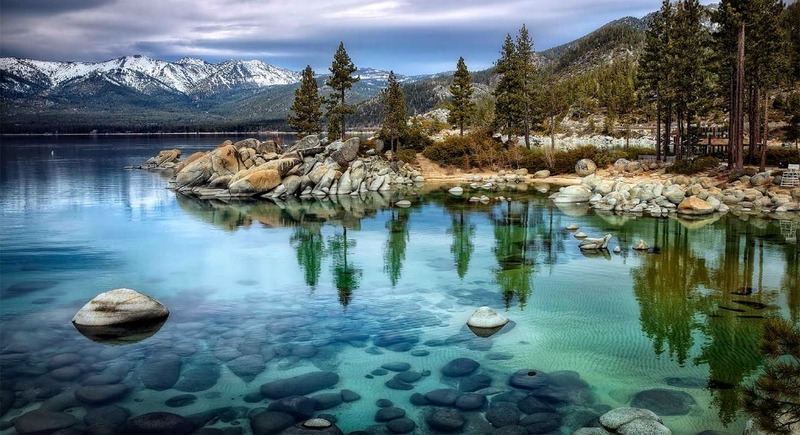 Lake Tahoe is the second deepest lake in the United States and the 16th deepest in the world, with a maximum depth measured at 501 meters (1,645 feet).It is also the fifth deepest lake in the world in average depth with average depth of 305 m (1,000 feet). It is the sixth largest lake by volume in the United States at 147 trillion liters (39 trillion gallons).The amount of water in Lake Tahoe is enough to supply each person in the U.S. with 190 liters (50 gallons) of water per day for 5 years. The temperature at the surface of Lake Tahoe is between 65 and 70 degrees Fahrenheit during the summer months and between 40 and 50 degrees Fahrenheit in the winter months. At its longest and widest, Lake Tahoe measures 35 kilometers (22 miles) by 19 kilometers (12 miles). Lake Tahoe has 116 kilometers (72 miles) of shoreline. There are 63 tributaries providing Lake Tahoe with a lot of its water. It is estimated that approximately half of the lake's water is derived from rain or snow landing in the lake itself. The water temperature near the surface generally cools to 4.5 to 10ºC (40 to 50ºF) during February and March and warms to 18 to 21ºC (65 to 70ºF) during August and September. Much of Lake Tahoe's shoreline is protected by the United States Forest Service, or they are otherwise protected because they lie within the borders of a state park. Clarity is determined by measuring the water depth at which an 8-inch diameter white disk disappears from view.When official measurements began in 1968, researchers could see a white disk submerged to a depth of 31.2 meters (102.4 feet);by 2014 that had dropped to an average of 23.7 meters (77.8 feet), according to the University of California-Davis Tahoe Environmental Research Center. But those measurements were an improvement from the lowest point at 19.5 meters (64 feet) in 1997 when the summits began. Cities on the shores of Lake Tahoe include South Lake Tahoe, Stateline, and Tahoe City. As light penetrates the Lake, water molecules absorb various colors.Fine particles and the exceptional clarity allow backscattering of the predominating light color toward the eye of an observer.The lake water appears blue as other colors in the light spectrum are absorbed at deeper depths and the predominant blue light is scattered back toward the observer’s eye. Approximately two-thirds of Lake Tahoe's shoreline is located in California. It is believed that the Lake Tahoe basin was formed approximately two to three million years ago, when the earth's crust cracked and blocks of land moved, creating Lake Tahoe's basin, the Carson Range, and the Sierra Nevada. This is called geological block faulting. The center of the Lake can appear indigo, as blue light is absorbed further, leaving more visible violet light as the predominant light color. In shallow areas, the water can appear emerald or turquoise in color since green is the predominant light color at shallow depths. In addition, under the right conditions, the Lake surface can reflect the adjacent mountains and the color of the sky. Lake Tahoe is the United States' second deepest lake and the 16th deepest lake in the world. Lake Tahoe is over 2 million years old. Tahoe is considered an ancient lake and is counted among the 20 oldest lakes in the world. Many, many years after the lake was formed and named, the large mountain at the north end of the lake erupted in a violent explosion. Hot lava, gases, and ashes escaped through the rupture in the earth’s surface. The lava flowed southward and traces of it can still be seen in folds on the lake bottom at the north end. The mountain itself is now known as Mount Pluto (2,626 meters (8,617 feet)). Lake Tahoe is fed by 63 tributaries, which drain an area about the same size as the lake; half the water entering the lake is rain or snow falling directly on it. The main body of Lake Tahoe does not freeze.The stored heat in the Lake’s massive amount of water compared to its relative surface area prevents the Lake from reaching freezing temperature under the prevailing climatic conditions. Lake Tahoe's maximum width is 12 miles; its maximum length is 22 miles; its maximum depth is 1645 feet. Lake Tahoe's average depth is 1000 feet. Its surface area is 191 square miles. The Truckee River is the lake’s only outlet.Only one third of the water that leaves the lake leaves via the Truckee, however the rest evaporates from the lake’s vast surface.The average daily evaporation of water from the lake surface would serve the daily needs of 3.3 million Americans. The surrounding mountain peaks vary from 2,750 to nearly 3,350 (9,000 to nearly 11,000 feet). The sun shines on average 75% of the time during daylight hours. There are about 270 days sunny and partly sunny days each year. Lake Tahoe is an alpine lake which means its elevation is very high, and its water is colder, which decreases the ability of moss and algae to grow. This means it is a clearer lake than lower elevation lakes. The biggest fish ever caught in Lake Tahoe, a Mackinaw lake trout, weighed 16.95 kilograms (37 pounds and 6 ounces). The area surrounding the lake is also referred to as Lake Tahoe, or simply Tahoe. It is home to a number of ski resorts, summer outdoor recreation, and tourist attractions. There are numerous hiking and mountain biking trails around the lake.They range widely in length, difficulty and popularity. Year-round resident population is 53,000. Total population can reach 300,000 on peak days. About 3 million people visit Lake Tahoe each year. There are six 24-hour casinos in the South Lake Tahoe area. Lake Tahoe does not freeze over due to the tremendous amount of water it contains, but in some areas the shoreline may develop a thin sheet of ice. It is estimated that Lake Tahoe holds 39 trillion gallons of water. A dam at its outlet controls its outflow. Some famous people who have lived in or near Lake Tahoe include: Charles Bronson, Cher, Natalie Cole,Sammy Davis Jr., Liza Minelli, Wayne Newton and the Captain and Tennile. Lake Tahoe is a popular tourist destination with approximately three million visitors each year. Lake Tahoe served as a filming location for 1974’s ‘Godfather II‘ and 1992’s ‘The Bodyguard‘ among other movies.